BOSTON, MA--(Marketwired - Jan 23, 2017) - Amid growing and global political and economic uncertainties, some institutions may be tempted to direct more of their portfolios toward simple, 70/30 or 60/40 stock/bond allocations, which have largely produced attractive returns since 2009. But that performance is unlikely to be repeated over the coming decade, and investors would be wise to avoid oversimplifying their portfolios, as detailed in recently published research from the global investment firm Cambridge Associates. "As we move further into 2017, institutional investors should place a premium on diversification," says Celia Dallas, Chief Investment Strategist at Cambridge Associates. "The siren song of the simplified portfolio may be difficult to resist, given the ongoing bull market. But diversified portfolios provide a better long-term strategy for endowments, foundations, pensions and any institution seeking to preserve or grow its purchasing power, while supporting a steady flow of spending into the future." 1. Don't make big tactical bets based on macro and political developments. Instead, investors should use discipline in establishing and sizing them. 2. Don't make decisions while looking through the rearview mirror. "Investors should consider what's worked in the recent past, but should focus on looking ahead to where market inflection points might be based on historical trends and areas of low valuation," says Dallas. "Remember that the markets are cyclical." 3. Don't stick with a strategy designed to work only in the falling-rate environment of the last 35 years. Savvy investors will look for investments that can win in a rising rate environment, even if overall growth disappoints. 4. Don't ignore the risk of rising inflation. "Investments that offer cheap protections against inflation may be helpful in 2017," Dallas adds. "Most of these opportunities can be found in real assets." 5. Don't give up on diversification. Simple, stock/bond portfolios have performed very well in recent years, but strategically diversified portfolios will likely provide the best long-term returns. "Diversification protects against uncertainty and offers a good balance between return-seeking to meet objectives, and the stability to support spending and other cash needs," says Dallas. 6. Don't overdo it when seeking to improve fees. Negotiating better fees and terms will continue to be important in the search for alpha going into 2017, and while negotiating makes sense, investors should be willing to pay up for skilled managers that can potentially generate excess returns. 7. Don't bucket hedge funds as if they're all the same. Institutions should consider the role they play in a portfolio and maintain selectivity in seeking out managers that are high quality with a repeatable value proposition and/or provide exposures that would be difficult to replicate outside the hedge fund arena. 8. Don't take on too much risk eight years into a bull market. This late in the US economic cycle investors should be particularly diligent in looking for assets priced to compensate for the risk they take on. Markets that warrant caution include US and European investment grade and high yield credit, late-stage venture capital, and large buyouts. 9. Don't ignore currency risk. Investors should be aware of currency volatility and the impact it may have on their investments. This understanding should inform decisions about whether or not to strategically hedge currency exposures and should be incorporated into asset allocation decisions. 10. Don't cut back on defensive assets to try to increase performance. Investors should "stress test" their portfolios and manage liquidity needs tightly to strike the right balance. Defense is necessary in today's uncertain environment, but at the same time, too much defense can lower returns in an already challenging return environment. Dallas continues: "The smartest institutions maintain a long-term perspective, informed by the long span of history with an understanding of how world events may shape the future. Diversified portfolios help investors set up for success over decades of market cycles to come, by looking to participate strongly in market upside, while having enough varied defense to manage liquidity needs and other risk requirements during difficult times. Amid today's political and economic uncertainty, it's critical to remain vigilant, and avoid the temptation of an undiversified portfolio." To read more from Dallas on why investors shouldn't simplify to a 70/30 portfolio, check out CA Answers: Why Shouldn't Investors Simplify to a 70/30 Portfolio? here: https://www.cambridgeassociates.com/research/ca-answers-why-shouldnt-investors-simplify-to-a-7030-portfolio. CA Answers is a bi-weekly research note that addresses clients' questions about market action and the market environment. To read VantagePoint First Quarter 2017, which details how investors can respond to each of the 10 temptations, click here: https://www.cambridgeassociates.com/research/vantagepoint-first-quarter-2017. VantagePoint is Cambridge Associates' detailed portfolio advice publication produced quarterly by Chief Investment Strategist Celia Dallas. 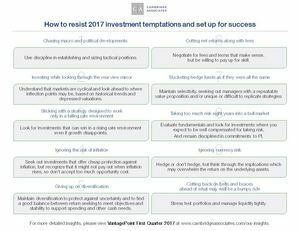 To view an infographic that outlines the 10 investment temptations and the corollary recommendation for each, click here: https://www.cambridgeassociates.com/wp-content/uploads/2017/01/VP-1Q17-Infographic.jpg. Cambridge Associates is a global investment firm founded in 1973 that builds customised investment portfolios for institutional investors and private clients around the world. Working alongside its early clients, among them several leading universities, the firm pioneered the strategy of high equity orientation and broad diversification, which since the 1980s has been a primary driver of performance for these leading fiduciary investors. Cambridge Associates serves over 1,100 global investors -- primarily foundations and endowments, pensions and family offices -- and delivers a range of services, including outsourced investment (OCIO) solutions, traditional advisory services, and access to research and tools across global asset classes. Cambridge Associates has more than 1,300 employees -- including over 150 research staff - serving its client base globally. The firm maintains offices in Arlington, VA; Boston; Dallas; Menlo Park and San Francisco, CA; London, UK; Singapore; Sydney; and Beijing. Cambridge Associates consists of five global investment consulting affiliates that are all under common ownership and control. For more information about Cambridge Associates, please visit www.cambridgeassociates.com. Copyright © Cambridge Associates Limited 2017. All rights reserved.